My friend Gywn, a bee-you-ti-ful wheaton Scottie gal, sent me a pee mail the other day. She was worried about my deep, dark mood about going over the Rainbow Bridge. I’m much better now, but she made me feel even better! WHOA!!!!!!!!! SHUT THE FRONT DOOR!!!! I truly believe that happened. And that our loved ones’ souls never leave us. And now I know that’s true. And I believe some people can see our souls. Some people can’t. Dogs, well, we dogs can see lots of things. I’m feeling even better now that I know I’ll never leave my peeps. I’ll just be taking care of them. Silently. Watching. And being mindful of Them. And They won’t leave me either. They’ll be right there with me every step I take. Just like BoBo who was with Them after he passed and helped guide Them to me. Little ‘ole me. Right here. Whew. Glad that’s settled. Thanks, Gwyneth! And thanks to y’all who told me this when I was in my funk. 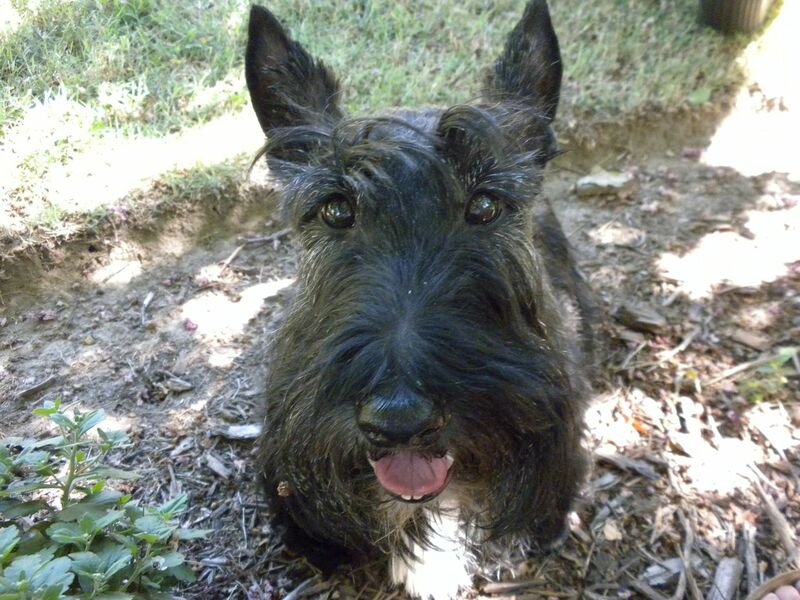 This entry was posted in The Scottie Chronicles and tagged death, death of a loved one, dogs, grief, life, loss, pets, Scotties, Stuart. Bookmark the permalink. What a sweet post and I’m happy to hear you’re feeling better about “what if” and “what happens” because it’s true – we never do REALLY go away – we just keep watch from another place. So to humans – so it’s all good. I’ve been thinking a lot about deep stuff too since I’m sneaking up to the BIG 15 and on meds now…..but I know – as do you – that we just really do go on and on and on and – well – you get the picture! Be happy………that’s my new motto! Oh, Sammy, you are wise. Wise beyond years. We do just go on and on…. I’m sure we can see souls and that’s probably the reason that we sometimes bark at people we never met before… humans call that: barking without a reason… but we dogs know it better, right? OOOOHHHH! You’re so right about that. I do that. I bark out the window when She thinks there’s nobody there. You and I know there is. Happy Barkday, by the way! We believe that it’s true too – we carry all our dear friends round in our hearts. Yes we do. And this makes me feel better!!!! I’m so glad you liked my (true) story. It makes me feel good whenever I think about it. Now about that middle bottom tooth….THAT’s another story I want to hear!! Oh my. I’ll have to dredge up that old post. It wasn’t pretty. Fence aggression. And I wasn’t in the fence! I was on the other side! Stuart I am a believer also. Strange things do happen. I remember how you said Bobo’s doggie placemat was in the bottom of the can untouched by the trash and how the card appeared and your Dad thought your Mom had done that but hadn’t. My Lee had a perfect heart make appear on her arm where her last Scot Half Pence always rested his head. It formed in two days. The second day would have been his birthday. Lee actually went to the dermatologist afraid something coming that fast might be Melanoma. The dermatologist had never seen such a perfect heart form and she new it was not there the month before because Lee had gone in for her yearly skin checkup. Oh an the heart mark is still there! SWTS, that’s gonna be a tough act to top. NO IT ISN’T????? Oh my. What a story. OH MY DAWG!!!!!! Sweet William, thank you for remembering that BoBo story. That was really unbelievable. And it really happened. And thank you for sharing your story about Lee’s arm. That made me smile so much to read it. Picturing Scot Half Pence resting his head on her arm. I’m getting leaky. Oh my. I’m glad you snapped out of it. 2014 has been tough. First Daisy, then Jazzi. They wouldn’t want you to sulk. No sulking. No. No. No. I do that enough for other reasons. Like when I want more beans. When I see Them packing Their suitcases. Stuff like that. Thanks for posting that Buddy. I had a brother before me that left too early and Jazzi going to the big taco stand in the sky has made me and my mom a little droopy too. Mom says we have to stop asking “Why” cuz nobody knows. I appreciate the perspective in the pee mail you got … yes, I do. Too early for so many. Nice to hear from you. Sometimes I have trouble barking at you at your place, but I visit! Yes. We do know things happen that can’t be explained. By humans anyway. We get it. That’s a great story…we’ve been having a rough go too, with Grampy not being well, and Jazzi, and sometimes it’s just too much! but it’s nice to hear these nice things. And Heavens! What a neat story SWTS told about his Lee! Will you retell the Bobo story? We have trouble finding it in the archives. We’ve been thinking about your Grampy. Crossed our paws, too. SWTS’s story was WWWAAAAY COOL along with Gwyn’s and so many others. I’ll have to reblog that post about the BoBo story. I’d be glad to! Anything for you my Edgar friend. OH MY DAWGGGGGGGG! This is too much. IT’S TRUE, this stuff isn’t it?? Yes! Our pals are always around us!!!! I keep feeling better and better. I better tell mine to stop tripping me. We nine over the bridge, it is no wonder that I am always tripping on something. At least they’re your pals and want to be near you. And under foot, too! ArOOOO! You raise a great point. Without those before us, we wouldn’t be who we are today, right? Thanks so much for weighing in on this heavy subject. That is great. I feel better too. Thank you for sharing. I’m glad you feel better. I do, too. ROOOO! Glad you came around Stuart, we too were at a loss over our pal Jazzi, we had to take time to reflect about it, and so did the peeps, they take it hard when a Scottie crosses the bridge. Put in a while it just makes us closer. The peeps say they look for that perfect love, and we are right in front of them given it our all, and they do the same for us! I couldn’t have said it better myself my friends. Giving it our all. That’s what we do! Thanks! Oh. I’m weepy. “Love never dies.” YOU’RE RIGHT!!!!!!! Thanks my friend. I don’t think I’d want to silently watch. I’d want to bark. First, let me say how very sorry We are for the loss of your beloved Lizzy. It’s so, so difficult. We do believe, like so many of our blog pals, that she is still with you. There may come a time when you see her in the garden or hear her gentle breathing as she sleeps. She’s there. I’m speechless. This is a breathtaking story. Aren’t your anipals the BEST???? Oh yes, I totally agree about our dogs knowing things and seeing things before we EVER do. Sending lots of love and hugs…..